Being a huge fan of Kiehl’s, I like to keep up with what great products they have coming out. This one is awesome in so many ways! It’s been nothing short of crazy lately with all of the extreme forces coming from mother nature, and we’ve all heard that global warming is the main reason. 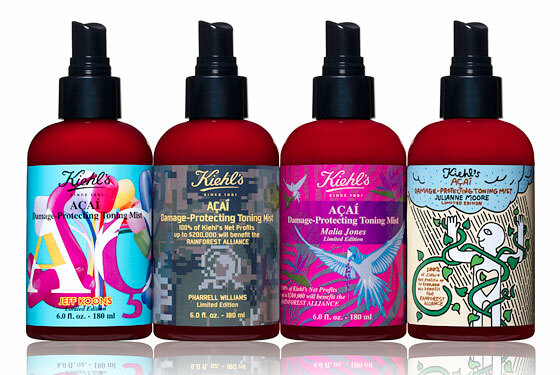 Well Kiehl’s is teaming up with the Rainforest Alliance (a company dedicated to preservation and education of the rainforest), as well as some noteworthy celebs who have designed the packeging for the new product line from Kiehl’s. Julianne Moore, Jeff Koons, Pharrell Williams, and Malia Jones have each designed their own bottles, which 100% of the proceeds will go to the Rainforest Alliance. What is in the bottle? This new antioxidant-infused tonic is revolutionary. It contains, the powerful acai berry, aloe vera, lavender, orange fruit water, and rosemary. Not only will it protect, soothe, and freshen your skin, but it will do the same for the atmosphere. Tap into your inner beauty in a whole new way. Available where Kieh’s is sold or online. I just finished using my bottle last week! Its amazing, it totally got rid of my laugh lines!! Absolutely brilliant product!